You’re right, this cake is perfect for spring! Gorgeous cake Maria and Josh! I am so in love with strawberries right now. Yum! Maria, it looks awesome. I just scored on tons of fresh strawberries at the groc store and they’d be perfect w/ this cake! oh yum…summer in a cake! what a beautiful recipe. it’s 20 in nyc this morning, so thanks for the glimpse of summer! This looks amazing! I can’t wait to try it. I love the way the strawberries stay so pretty looking – sometimes they get kind of brownish and ugly when they are baked – not here, Yum! Maria….soooo weird you and I have been creating the same recipes these days. I did a strawberry cake this weekend too. This looks wonderful! Looks delicious and has me in the mood for summeR! Pretty pretty! This speaks to what I’m craving right now! Love the strawberries with the daisies in the photos, too. I had made this last summer and it is great. I remember my dad saying, “how can something so simple be so delicious.” Needless to say it was a hit. Perfect for spring! Love this! Your strawberry cake is making me crave strawberries and spring! Beautiful. Looks wonderful. Reminds me of a galette… in cake form! What a beautiful cake! Love it! I bought a bunch of the 88 cent strawberries too! And my were they tasty, I wish I had more. Especially to make this cake, perfect for spring indeed! I have the worst time getting fresh strawberries on my island, and when I can get them, they cost a small fortune, but this cake looks so worth it! I stocked up on strawberries for 88 cents too! Yes for Spring time! (even if we just got snow this morning). Looks like I might be able to use up what I have left! Mmmmm, mmmmm! This looks like the perfect treat for any time of day! Gorgeous! I can’t wait for the weather to warm up… I have the same colander, ps, and I also use it specifically for my berries! Wow $.88/lb?? They’re never that cheap here, but you can bet I’d be stocking up too if they were 🙂 The cake looks great! I love how chunky with strawberries that cake is! I can’t believe how cheap they are up by you…I can’t pick them that cheap here! This is such a lovely cake! I love the plump strawberries just bursting out of it. So yummy! 88 cents a pound?? man, the store here had them on sale for an unusually cheap 3.99 a pound. clearly i’m living in the wrong part of the county. but this cake looks amazing! i’m going to try it out as soon as i can get some decent strawberries for under a hundred dollars. Wow, my hubby would love this. Strawberries are his favorite. I bet a bit of whip cream would make this extra fabulous! I love how pretty it is! I think I have about 1/2 cup buttermilk left…might have to make this this week! It’s killing me that you live so far away. For one, I want a piece of this NOW. For two, 88 cents a pound?!? NO FAIR!!!! This looks lovely! Reminds me of a clafouti. Beautiful pix also. Looks great, Maria. Loving the strawberries right now, too! I just bought a pound of strawberries so I might make this cake this week! Yours looks lovely. How absolutely beautiful! I’d probably dollop on some vanilla ice cream and cover it in the bittersweet hot fudge I posted today…perfect dessert! I can’t wait until really good strawberries can be found here! This cake sounds so refreshing! What a delicious cake – makes me feel ready for summertime! A beautiful cake. Stock up on those strawberries now – my mom was just in CA and all the strawberry fields were flooded — prices will be going through the roof soon! This looks like a fabulous spring dessert! Yum! this looks so fresh and tasty. I’m definitely going to try this today. I go nuts over strawberries myself and this seems like the perfect way to enjoy them. I’ve become quite obsessed with strawberries lately too and have been eating them every day since our local harvest started. This lovely, simple, not-too-sweet cake is right up my alley and looks totally delicious! The strawberries in that bright green colander look beautiful. What a perfect cake for spring. I have always been obsessed with strawberries. I could eat a package in one setting. This looks great. Perfect with whipped cream. Wow! That looks great – can’t wait till strawberries are on sale here. I love strawberries and it’s the first real sign that spring is here. Love this cake. 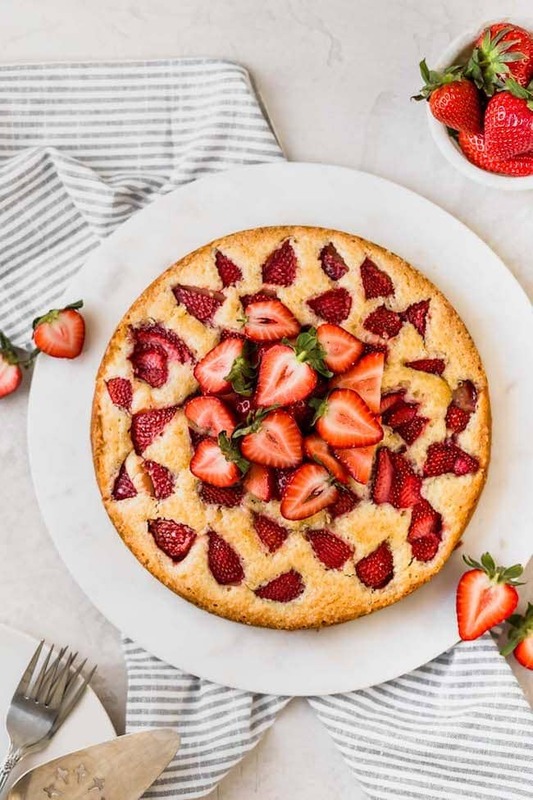 Another great simple cake to make…and with strawberries. I too just found a great bargain on strawberries and they were so sweet. I think I prefer those from FL…these were from Plant City, FL. This looks absolutely perfect for spring/summer! It makes me want to put some flip-flops and shorts on! We both posted strawberry recipes today! I’m glad you’re still able to enjoy strawberries 🙂 This cake looks scrumptious. Looks like a perfect dessert for strawberry season. I’ve been loving strawberries lately!! We had a great sale last week and I stocked up on some enormous berries. I just might try this recipe to use some of them up! 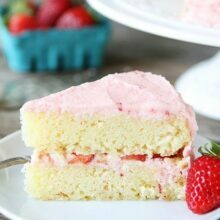 This is one of my favorite strawberry cake recipes. It really is good and kind of tastes like a cobbler. I add blueberries to mine too. yum! Beautiful strawberries! I can’t wait until they’re in season here! 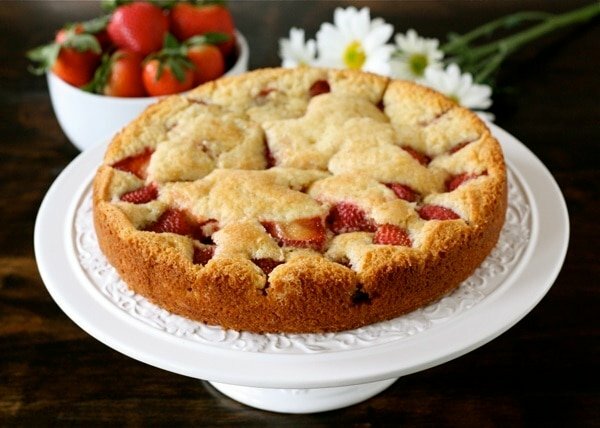 Oooh, definitely going to the farm this weekend to pick up fresh strawberries for this! Would it be crazy if I wanted to eat this for brunch? I am pregnant too, and strawberries are always calling my name. 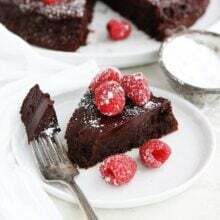 I have been dipping mine in warmed Nutella, eating them plain, or in salad…I think I will try making this cake soon. 🙂 Thanks for the recipe! Very pretty cake. I guess Summer is around the corner! Hi – I read your blog and love your recipes. This is the first time I have commented b/c I couldn’t resist suggesting you buy “The Little Mouse, the Red Ripe Strawberry and the Big Hungry Bear” for your baby-to-be. It is a charming book that children (and adults) love and it will help you remember the time when you were craving “red ripe strawberries”. Thanks for reading our blog and thank you for the book suggestion. I am going to check it out. Thanks! Just the cake I want to make gluten free! Look how Spring and pretty that is! Strawberry season starts in in March over here so this is perfect! I cant wait for fresh strawberries. Looks good Maria! I made this yesterday and it is amazing! One change I made was to add a TBSP of orange zest in with the batter. It gave it a wonderful hint of citrus. Very good recipe. Great idea to add citrus. Glad you enjoyed the cake! This cake looks so pretty with the strawberries peaking through the top! What a beautiful and simple cake… Love it! I can’t wait for local strawberries… The ones at the stores here are definitely not up to par at this point! So, I have no idea what turbinato sugar is, and couldn’t find any in my local grocery store today, so I am hoping regular sugar will be just as good?! And, I don’t have a spring form pan, so I hope my pie plate works well! I am going to begin making this as soon as I post this comment! Thanks for the great recipes, I love your site! Turbinado sugar is a course sugar, sugar in the raw. Regular sugar will work fine though. I hope you enjoyed the cake! I always keep strawberries around because they’re the perfect fruit for everything. Too bad I have another two months before they’re actually good. 🙁 Spring will be here eventually. I tell myself that daily. I made a very similar cake to this quite recently with raspberries. It’s such a nice simple cake with fruit and just a little bit of quietly sweet cake around it. Such a winning combination. I do love strawberries and never turn down a strawberry shortcake. Looks wonderful! That’s such a steal for strawberries too. I hope I can find a price like that soon. This cake makes me thankful that we are able to get strawberries year around. I love this! That looks beautiful and delicious….love strawberries! You’re so lucky to have such gorgeous looking strawberries! The stores here in Vancouver have strawberries that look insipid. The cake looks phenomenal! So pretty! 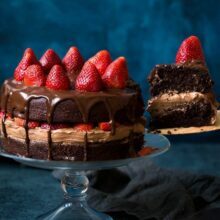 This cake is beautiful and I love the strawberries. Can’t wait for my market to get the “spring” batches in. Ive been making this cake for a few years now! I use whole wheat pastry flour instead and it gives it a nutty flavor. This is strawberry shortcake all in one!! Dont forget the whipped cream on top! I ripped the recipe out of Marthas magazine years ago and decided to try it. I wish I tried it back then and didnt wait so long!!! Beautiful!!!! I make something similar, but not so pretty! We have a huge strawberry patch, every year I have to figure out what to do with all that stuff. I can’t wait for strawberries to be in season. I love strawberries too and we always have an over abundance. Can’t wait to make this cake this summer! Such a pretty cake for Springtime! I made this cake last night and I was a bit skeptical when I saw the consistency of the batter. It was thick like peanut butter and I really had to spread it into the pan. As I was placing the sliced strawberries on the cake I thought for sure this cake was not going to turn out all that great. 35 minutes later I took it out of the oven (I used a 10inch round cake pan) and although it stuck to the bottom of the pan despite greasing it first it tasted really good! Next time I would try to gently fold some strawberries into the batter before spreading it out in the pan and I would also add a tsp of cinnamon. Great recipe! Thanks for sharing! What a pretty cake! I love how it looks on the stand. I will be making this as soon as those really good berries are available this spring. I love how tender strawberries get when they’re baked! I made a very similar cake and loved it. It’s so light and perfect for spring! this looks awesome! i can’t wait to try to make this vegan. saving to my online cookbook, cookmarked.com! I would love to try this tomorrow… we just got 6 pounds of strawberries on sale! i love strawberry season, and this is a fine use for its bounty–beautiful work! So pretty and perfect for spring! I bought strawberries last week and they were a beautiful red color but not good at all – hope they get better soon around here! Just wanted you to know I made this for a church potluck today..and it disappeared so fast we never got to try it! But it sure looked pretty on a plate…so hubby is asking me to please make it again–for home this time. Thanks so much–it was fun hearing how many others looks at your site as well…you have a loyal following in MN! So glad the cake was a hit. You will have to make it again so you can enjoy it:) Thanks so much! I needed a quick dessert for some guests that were stopping by on short notice. I remembered this cake and whipped it up in no time. It was perfect – easy, pretty and delicious! My guests loved it – thanks! I love how easy this cake is too. Glad you and your guests enjoyed it. I want this strawberry cake. And your cool green colander. Oh, this cake! I know it’s true. THANK YOU! I made this cake this evening, and it is absolutely DELICIOUS! It’s like the best things about strawberry shortcake, all in one slice. You are very welcome! Glad you liked the cake. This is *exactly* the cake I was looking for! My strawberry-loving daughter is turning 3 in a few days and I wanted to make a delicious homemade strawberry cake for her. Unfortunately, all the other “strawberry cake” recipes I found before Google sent me here involved, of all things, strawberry jello! I can’t even imagine calling that strawberry cake. This cake looks excellent and will be gracing our table soon (under some lovely whipped strawberry icing, 3 candles, and some party hats). I’m definitely subscribing to your blog! Thanks Jamie! Glad you liked the cake, it is one of my favorites too! 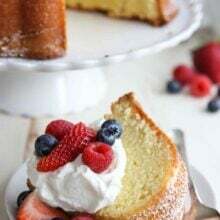 Pingback: Strawberry and Lemon Cake with Lemon Glaze for Baketogether with Abby Dodge — A Denver Colorado Food Blog - Sharing food through recipes and photography. Oh my gosh, that looks delicious and strawberries are my absolute favorite!!! i think i just made this exact cake! it was delicious! I still have the magazine that has this recipe in it. I have made this many, many times! So good. Loved the flavors of this cake. I did have a problem! I bought a quart of fresh berries and used them. The cake on the bottom was delis, but the top stayed doughy I believe because the berries were so juicy. What could I have done differently? I also baked it longer. I want to make it again. Make sure you bake the cake long enough if the berries are extra juicy. Also be carefully when stirring them in so you don’t break up the berries, which can add extra juice. Love this cake. My daughter and I made it yesterday evening and it was delicious!!! Thanks for the recipe. I am going to make this again but I am going to add a glaze with a fruit dip recipe I have. Hopefully it will be as good as the first one we made! Thank you for the “how to guide” would you be so kind and tell me how much 1/2 a cup of flour is, in grams ? Thank you for sharing. one of my all time favorite fruits! Looks great in the cake! Oh my gosh, this looks so good! And the strawberries are perfect at my grocery store right now… I think I’m going to have to make this ASAP! Made this strawberry cake today, and my family enjoyed it. My husband especially likes your recipe for the oatmeal pb cookies. Thanks for the delicious recipes! What is Turbinado sugar please? This did not turn out for me. Still raw after 1 hr. Hi there! Do you think dry buttermilk would work ok in this recipe? I’m always worried it won’t add the right texture or flavor, but it’s just so convenient! Loved this ! My 13 and 8 year old did it by themselves..what other fruits can be used instead of strawberries ? will definitely do this again. i am making this tonite!!! It’s so pretty. If you’re a fan of almond, replace the vanilla with almond extract. Serve with fresh crushed strawberries and whipped cream. Divine!!! I made this cake for my family yesterday. It was awesome and everyone loved it. My baking isn’t always stellar but this cake was easy to make and turned out excellent. Thank you for this recipe! 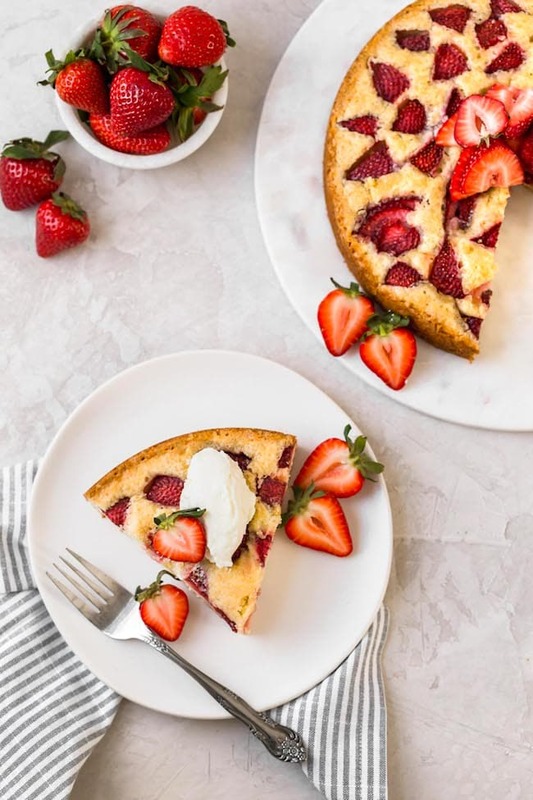 As someone who is completely addicted to fresh strawberries, I can’t tell you how amazing this looks… I’m always searching for new ways to incorporate strawberries into my baking… sometimes it works out amazing, sometimes not so much lol. Rather than just putting this one on my ever-growing list of must try recipes, I’m going to throw the ingredients on the list for my next trip to the grocery store. I’ll let you know how it turns out for me. Thanks so much for the great recipe!! Made this for Easter and it was delicious! 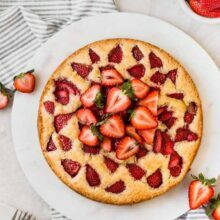 Hello, is there a way to make this strawberry cake with less sugar for a diabetic? I have a suggestion: Replace the sugar with Swerve. That’s what I’m going to try. So in love with summer produce…and this cake! 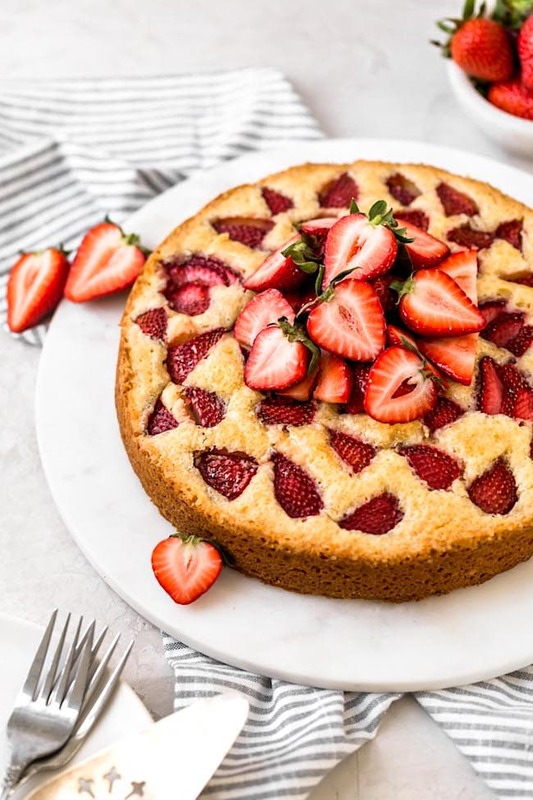 I’m going to make this cake but I have a question: When you place the strawberries on top of the batter, do they sink down, or do you gently mix them into the batter? I want them to be incorporated throughout the cake.